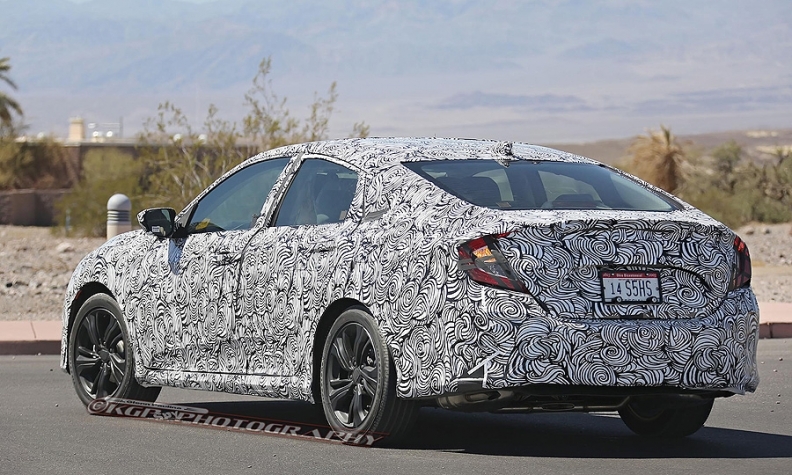 Honda's 2016 redesigned Civic, pictured, debuts in production form this year. It will offer a 1.5-liter turbocharged four-cylinder engine. Later versions of the Accord midsize sedan and CR-V crossover will also use that engine. "The Japanese were able to afford to not be at the absolute cutting edge of powertrain technology for a few years." It's a cry echoing through the halls of Honda: The turbos are coming! The turbos are coming! And it's about time. Japan's Big 3 -- Honda, Toyota and Nissan -- are conspicuously late to the turbo party. Walk onto a Honda or Toyota lot and you won't see a single vehicle with a turbo under the hood. At Nissan, only the Juke crossover and the fire-breathing GT-R supercar use them. Meanwhile, Ford and some European brands use turbocharged engines extensively, as do an increasing number of models from other U.S. makes and the Korean brands. What explains Japan's moving so late to turbos? They didn't need to until now. "The Japanese were able to wait longer to adopt these technologies because they could," said Ed Kim, vice president of industry analysis at AutoPacific. "They had less to prove to the buying public." Honda, Toyota and Nissan had many models that were at or near the top of their segments for fuel economy without adopting technologies such as turbos, direct injection and multispeed or continuously variable transmissions, or using them more sparingly than the rest of the industry. This made them appealing to car buyers, as well as government regulators watching emissions and fuel economy averages. Waiting also saved these automakers piles of money that they could invest in developing longer-term strategies such as Nissan's Leaf electric car or Toyota and Honda's hydrogen fuel cell cars. But these brands are beginning to reach the efficiency limits of their older technologies. To keep pace with rivals -- and regulators -- Japan's 3 are planning big changes over the next five years. Honda will lead the turbo charge, taking advantage of an opportunity to inject some power into its bread-and-butter products. The automaker's new Civic, debuting in production form this year, will offer a 1.5-liter turbocharged four-cylinder engine. Later versions of the Accord midsize sedan and CR-V crossover will also use that engine. These three nameplates make up the backbone of Honda's lineup: In 2014 they accounted for more than 1 million sales, or 68 percent of Honda Motor Co.'s U.S. volume. As such they will have to carry the bulk of Honda's fuel-economy compliance burden. "Downsized turbocharged engines offer the power that the customer wants along with the efficiencies of fuel economy and the benefits that go along with the lightweighting," Frank Paluch, president of Honda R&D Americas, told Automotive News. Toyota's approach will be more measured in the coming years. A 2.0-liter turbocharged four-cylinder engine will replace a V-6 in several Toyota and Lexus nameplates, including the Camry and Lexus IS. But Toyota won't yet replace its mainstream four-cylinder engines with turbos. Instead, look for larger direct-injected engines that use the more efficient Atkinson cycle combustion, and a broader use of CVTs. "The powertrain is still an area where we see ourselves as being able to squeeze out a significant amount of efficiency," said Andrew Coetzee, Toyota's group vice president for product planning. Nissan, meanwhile, has embraced CVTs in the name of efficiency. Its adoption of turbos will be slower than Honda's and Toyota's. In the meantime, it will focus on adding direct injection to its engines. Not all the changes coming from Japan are under the hood. Nissan, Honda and Toyota also plan to make up lost ground in infotainment systems. "Once upon a time Japan was thought as the ultimate tech mecca, and now they're behind on infotainment technologies," AutoPacific's Kim said. "So look for some real progress in terms of getting their infotainment systems up to date."